By default, all of a Multi-Media unit’s cameras are assigned to the basic schedule. Customizing the basic schedule coordinates the recording of all cameras on that unit. 2. To use the Basic schedule grid, click the Recording Schedule tab. cells toggles recording from ON to OFF, or OFF to ON. See figure 81.
showing Fill block and Clear block commands. Click a command, as needed. customizing more than one cell at once: Clear row, Clear column, and so on. set using the same procedure. Fig. 82. 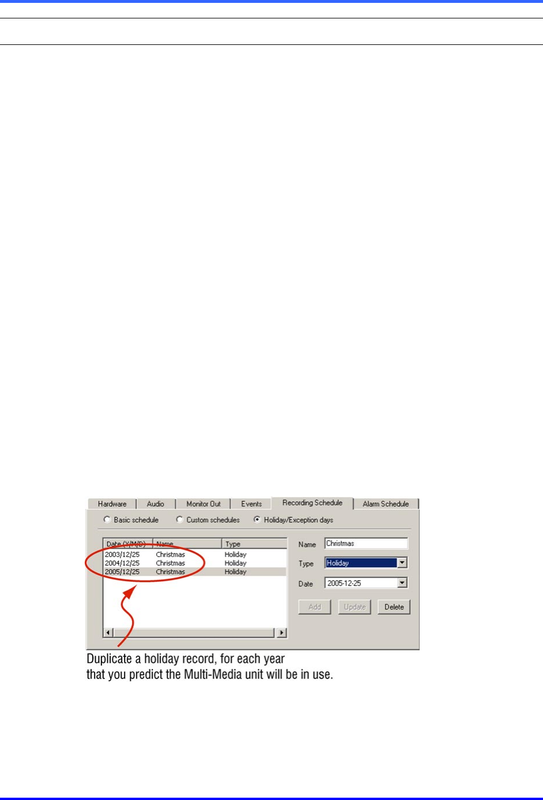 Specifying a holiday for the next few years.